Ever wake up in the middle of the night to your cat performing a version of Cirque de Soleil, usually directly above your head? Or maybe the opposite, you awake to your cat sitting on your chest, staring intently into your snoozing face, deep in kitty thoughts (of revenge). What in the H E double hockey sticks are these cats thinking? Let’s delve into cat comprehension. Did curiosity actually kill the cat? According to Webster, intelligence is the ability to acquire information, retain it, and utilize it to solve problems. Like humans, cats research their surroundings. Put a cat in a new place and every nook, cranny, and water glass will be studied. Science has shown that not only does a cat investigate new territory, cats have the ability to retain this knowledge. They retain information and often life-saving environmental details so curiosity didn’t kill the cat, it gave them the notoriety of having nine lives. Best day – you bring a cat home. Second-best day – you’ve gotten an uninterrupted night’s sleep with the cat in the house. Cats are nocturnal by nature and these lions of our living room still have those instincts deeply engrained in their primal brains. The spurt of wild energy that many cats get in the middle of the night, dubbed “midnight crazies,” or as we call it at my house “the kitty rave,” is their primal brains telling them that IT’S GO TIME. They often hunt their toys, or other objects, and rubber hair bands are often high on the list of household prey. Thankfully there are ways to curb this behavior. Tired dog = happy, well-rested, human, and the same concept can hold true getting your cat to chill out at night. Interactive toys, feather wands, hide and seek with treats are all great ways to get your cat’s brain and body tired. If you answer their meows and zooms by giving them food to get them to leave you alone, their hunting game is working, with rewards! To repeat this behavior night after night… who’s a smart kitty? Cats think three dimensionally, but they think in different dimensions than we do! When cats hear a noise, they can precisely locate it, while we can locate the direction the noise is coming from. 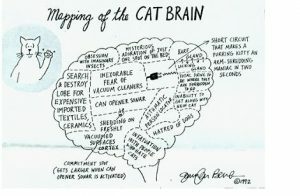 Cat brains are wired to pick up on wavelengths and patterns that prey or humans generate. When you wake up with your cat sitting on your chest staring, the cat is “mapping” its territory. Its intent stare while listening to your sounds and breathing patterns, give the cat a heightened sense of other changes in its environment (your bedroom). They’re not actually plotting revenge against you for not allowing them to lick your ice cream bowl. They’re keeping watch over you and themselves in case of a drastic and scary change in your environment. We’ve all seen it… drooling, rolling around meowing to the beat of reggae music (wait what music? ), widened pupils as if the colors your cat is seeing are just. so. colorful. That tell-all tail twitch and erratic zoomie behavior. Your cat SMELLED catnip! When catnip enters a cat’s body through its nostrils, cats exude behaviors common to females in heat. These effects last for about 10 minutes and the guilty Nip Head is temporarily immune to catnip’s effects for the next 30 minutes. Pulled from The Cat Guide’s 2017 online article, “Cats and Catnip,” by Sean Green, “When a cat smells catnip, Nepetalactone, one of catnip’s volatile oils, enters the cat’s nasal tissue, where it is believed to bind to protein receptors that stimulate sensory neurons. Then, these cells will provoke a reaction in neurons in the cat’s olfactory bulb, which project to the amygdala and other regions of the brain. These cells also stimulate response from the brain’s hypothalamus, which helps in regulating feelings such as emotions and hunger. The amygdala then combines the flow of information from the olfactory bulb cells and sends it to the brain regions governing the cat’s behavior responses. 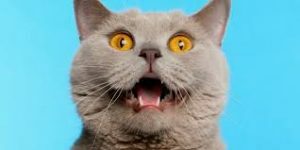 On the other hand, the hypothalamus regulates neuroendocrine responses of the cat’s brain and body via the pituitary gland – thus creating what it seems to be a “sexual response” in cats.” In laymen’s term’s or as your cat thinks the “lame human’s terms,” your cat is blissfully turned on! 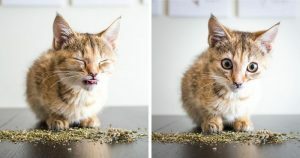 If your cat decides to nibble on the nip instead of smelling it, you’ll get more of a Bob Marley effect. Eating catnip puts your cat in a more mellow irie state (mon). Thanks for traveling the cat’s brain with us. We’re all safe for now, knowing that they’re not plotting against us every night… Or are they?! Does your Valentine make your tail wag? Hello Spay and Neuter Awareness Month!